With an extended playoff run, it feels like the season just ended. And yet, here we are with an Import Draft player picked, TBirds already off to NHL development camps and next seasons schedule already released. It’s starting to feel like there really is no off-season anymore. Let’s take a bit of a closer look at the upcoming schedule. This will be the first time that the TBirds and Silvertips have met in the Preseason Classic since 2011. Back to the 8 Tuesday night games. The Tuesday opponents in order are: Spokane, Edmonton, Spokane, Spokane, Everett, Kamloops, Red Deer, Spokane. Spokane seems to have become the de facto Tuesday night opponent as 13 of their 33 games at ShoWare Center have been on a Tuesday night. If you didn’t know better, you’d think they were an Eastern Conference team. The bigger eye-opener on Tuesday, though, is that game on 1/17 vs Everett. It seems the league (or at least Seattle) made an effort to cut down on the 3-in-3 weekends during the season as the TBirds only have 3. This Tuesday game against a division rival would seem to be a byproduct of that as there aren’t a lot of logical reasons to schedule it. Seattle certainly doesn’t need a division rival to drive Tuesday night sales and having it mid-week hurts overall sales as you won’t get Everett fans coming down like you would on a Friday or Saturday. (These same arguments would hold true for the Wednesday game in Everett on 11/23 but that is mitigated by the fact that the next day is a holiday.) If a computer is still writing the schedule for the league, it came up with a weird one for this game. 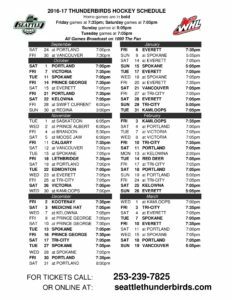 A tough stretch in February sees the Thunderbirds play 4 in 5 nights, including what seems to be the annual Family Day game in Kelowna at 2pm on 2/13 and then a Valentine’s Day 2-for-Tuesday the next night vs Red Deer. No 605pm Saturday starts on the schedule which could mean a couple things. Either they haven’t scheduled Hockey Challenge day yet or it’s moving days. I wouldn’t be terribly surprised if it moved to a Sunday but I am not basing that on any inside information. (Last year’s schedule release did not have a 605pm start time on it either and was subsequently changed so we could still see that happen here.) Schedule has been updated and now the game on 2/18 vs Portland is listed as a 605 start. Thanks to Debbie for pointing that out in the comments! Rematches with Kelowna occur at ShoWare Center on 10/22 and 2/25. Brandon does not come to ShoWare this season but they will see each other on the TBirds road trip on 11/4. You have to go all the way back to February 2004 to find a regular season Saturday road game in Vancouver. This year, the Thunderbirds play a Saturday game in Vancouver on 11/12. With the Giants being in their new home in Langley, the Thunderbirds being the defending Western Conference Champions and local product Mathew Barzal possibly playing his last season in the WHL, I can see why Vancouver may have wanted a Saturday home game. All those reasons, along with a more mobile Seattle fan base, should make for a full Langley Events Centre. For the first time in 5 seasons, the Chiefs and TBirds will not have a 3 game in 7 day stretch. They do play 6 times in 36 days, however, starting in December. This will be the third straight season that Seattle will play in Portland on a Sunday after not having done it before this streak since 2006-07. This seasons game falls on the Sunday before President’s Day so it should have a larger than normal Seattle contingent for a road Sunday game. Everett does not come to the ShoWare in the regular season until 2017. Seattle will have played Spokane and Portland at home 3 times each before the Silvertips come to town. Once the Silvertips do come to town on Jan 6, the schedule the next 2 weeks becomes ridiculous: vs EVE, @ SPO, @ EVE, vs SPO, vs EVE, @ SPO, @ EVE. It feels like the old round robin playoff series all over again. For the first time since the 2010-11 season, the Thunderbirds close out their regular season schedule with 2 home games. Looks like the increase in mid-week games helped cut down the number of 3 in 3 nights. This should help lessen fatigue as the season goes on with more days off between games. ← Banner raising: now or later? 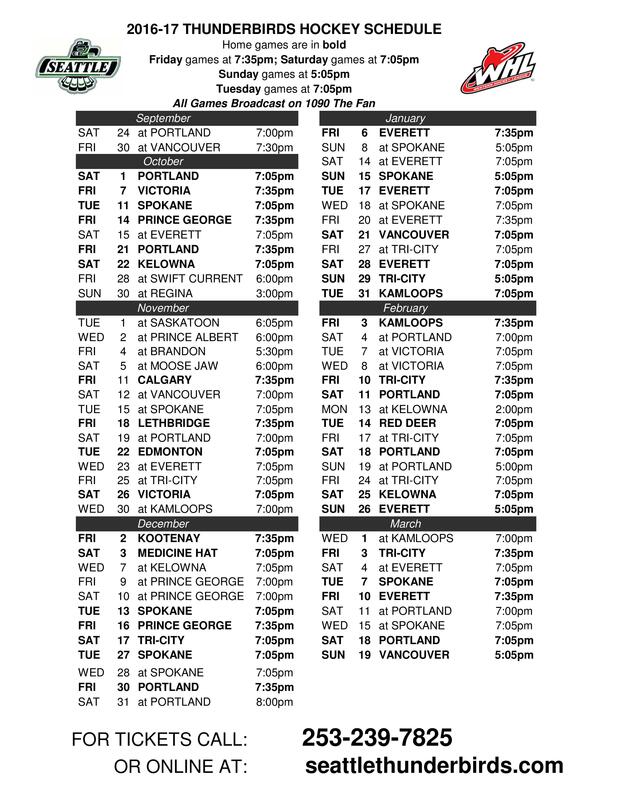 The schedule on the T-birds’ website lists Feb. 18 as a 6:05 start. Thanks! That was a change from when it was originally released (and when I started the post).